California Games was not only a launch title, but was the original Lynx pack-in game. Developed by Epyx, a company known primarily for its compilation sports titles, California Games will feel instantly familiar to those who have played any of their previous releases. The game features 4 sports; BMX biking, surfing, half pipe skateboarding, and footbag (hackey sack). The goal in each sport is to amass as many points as possible before time runs out. The BMX biking event has you riding on a downhill track, dodging obstacles while landing jumps and mid-air flips before either reaching the finish line or exhausting your time. In the surfing competition, you earn points by jumping off the crest of the wave and either going for hang time or trying to pull of a spin or two before hitting the water. Similarly with skateboarding, you are awarded points by pulling off handstands, fakeys, and other tricks. The goal in footbag is to try and keep the bag in the air for as long as possible, as with each subsequent kick, knee, or header you are awarded more and more points, until the bag hits the ground and the scale is reset. Surfing and BMX are my favorites, footbag is fun but gets old more quickly, and skateboarding has a hard time keeping my attention but would probably be more fun if I were better at it. The graphics in the game are quite impressive, especially for a launch title. 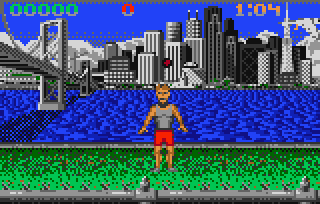 The player animation in the footbag competition sticks out as being incredible realistic, and the water in the surfing competition is incredibly detailed. The only problem I have with the graphics is with the footbag competition, and its almost a backhanded compliment. The background is so detailed that the bag doesn’t stick out enough, which at times makes it challenging to keep track of. California Games was a terrific choice as the initial pack-in for the Lynx, as the 4 events provide variety and the game as a whole really shows what the Lynx was capable of. Its pick-up-and-play nature really favors the handheld platform, and is always a good choice when you have 5 minutes to kill, but is also entertaining enough for longer gaming sessions. Buy California Games on GameGavel or Amazon. Tagged Atari, California Games, Epyx, Handheld, Lynx, Review, Sports. Bookmark the permalink.